How do you recognise a gentleman? Why, with a little help from Givenchy, the long term muse and mentor for chic ladies and dapper gentlemen, of course. 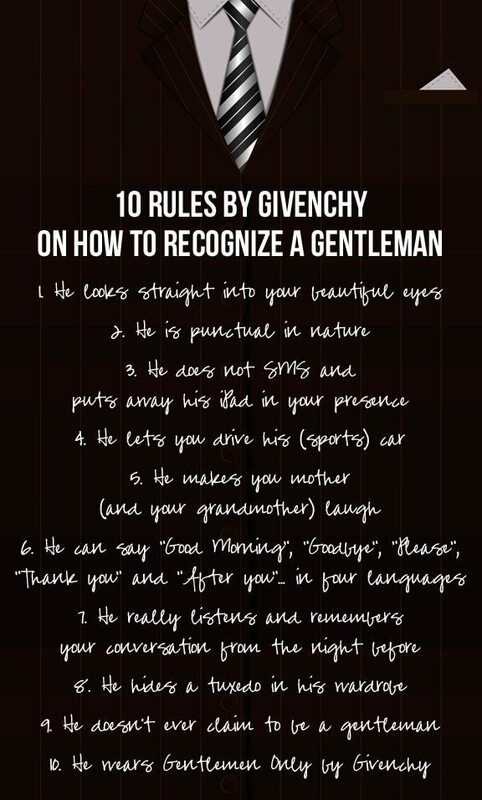 At Milan Fashion Week, the couture house revealed this 10-point test for gentlemanly quotient. While I can think of a few more essential gentlemanly traits (does not grumble while shopping with you, even if its for perfumes and lipsticks; does not allow you to lift heavy suitcases after a trip to Singapore; readily gives lends you money for casinos visits and shopping sprees; does NOT hog the TV or air conditioner remote… ! ), Mr. Husband scores 8/10 on the Givenchy list (tuxedo, yes; drive his vintage Delahaye 135 MS or detach him from the iPad… are you kidding?). Of course, he would score considerably lower on my own set of requirements but since Simon Baker seems to be a more universally accepted authority on chivalrous nuances, let’s go with this one for the moment. And yes, it helps that Mr. Husband has fallen completely in love with Gentlemen Only by Givenchy , nudging aside his treasured bottle of Penhaligon’s Sartorial to give this new fragrance pride of place on the dressing shelf. Which brings me to men’s fragrances in general. There’s a reason you’ve not been seeing them on this blog lately – most of the new launches in this category just seem to insipid for words. Literally. A vast majority are too bland and boring to be even disliked properly. Which is where Gentlemen Only stands out and makes its mark. Not surprising, considering that Givenchy has always been a trailblazer in the genre of men’s perfumes. Decades back, when every perfume house was busy going the cologne and lavender route for men, Hubert de Givenchy broke with tradition to craft the original Gentleman (launched in 1975). The potently aromatic and woody concoction made everyone sit up and take notice, paving the way for male perfumes that were both audacious and elegant at the same time. Now, almost 40 years later, Givenchy is rebooting the formula to give it a thoroughly contemporary feel. Gentlemen Only takes the signature tree bark that underpinned the ’70s Gentleman (patchouli, cedar and vetiver) and lightens it with a crisp blend of mandarin oranges, pink peppercorns and nutmeg. Consequently, where Gentleman comes across as deep, earthy and leathery, Gentlemen Only is fresh, spicy and woody. It’s like the difference between a cloak-ready English aristocrat and a man-of-the-world dressed in a sharp black suit and crisp white shirt. With a naked woman sitting on his lap. After all, Hubert de Givenchy did believe that a gentleman should aim for “Sir Walter Raleigh’s manners, Casanova’s seduction techniques and Beau Brummel’s wardrobe”. In fact, there is only suggestion that comes to mind for this otherwise superlative formula – the choice of Simon Baker as spokesperson. The Aussie actor does nothing for me (so lynch me!) and would much prefer to see Patrick Dempsey instead (he even owns a LOT of vintage sports cars). But then since I am a little obsessed with McDreamy Dempsey, maybe this suggestion should be taken with a pinch of salt. What about you? What’s on your list of essential qualities to be a gentleman?